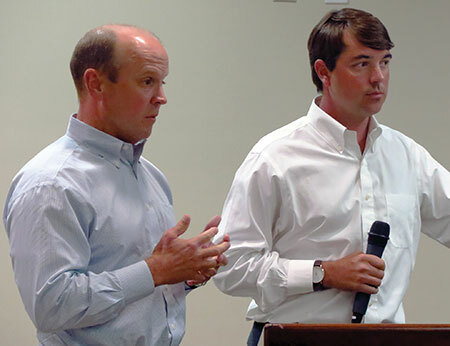 Retail Strategies Chief Executive Officer Robert Jolly and chief operations officer Scott VonCannon were present at the Hamilton City Council’s Tuesday, Aug. 4, meeting to answer questions before the city voted on whether or not to renew its contract with the agency. HAMILTON - The Hamilton City Council has once again delayed a decision to renew its contract with its economic development agency. The council unanimously tabled a vote to renew its agreement with Retail Strategies of Birmingham at a cost of $40,000 at its meeting on Tuesday, Sept. 4, pushing the decision into its second month either overdue or to terminate the contract. The City of Hamilton entered into a three-year partnership with the agency in July 2017.